Lease up to 80% Faster with Web and Virtual Reality Tours. Increase your inbound marketing effectiveness and capture your customer’s attention. Maximize your impressions by showcasing your rendered or captured tours on the web. We transform renderings and 360-degree panoramas of your properties into web-ready embeddable tours. We work with your web team to ensure each tour is embedded properly onto your website. Whether you are using Entrata, SquareSpace or WordPress - we can help. Every tour we create is compatible with all major browsers: Chrome, Firefox, Safari, Edge, and Internet Explorer. To save time and money, let your customers experience as many units as they like in virtual reality. They can narrow down their choices before any physical visits. Speed up the leasing cycle. Virtual reality always presents your properties in their perfect state. You can now rent out your demo units and maximize rental capacity. Bring your units directly to your customers. Impress future residents and demo your units anytime, anywhere. We pack the virtual tours created from renderings and 360-degree panoramas into an easy-to-use, branded app for you. Standalone VR is a convenient tool for your agents to show off your properties in the leasing office, trade show, or event. Navigate tours using a 3 degrees of freedom ("DOF") wireless controller. Hop around destinations with a natural point-and-click interface. 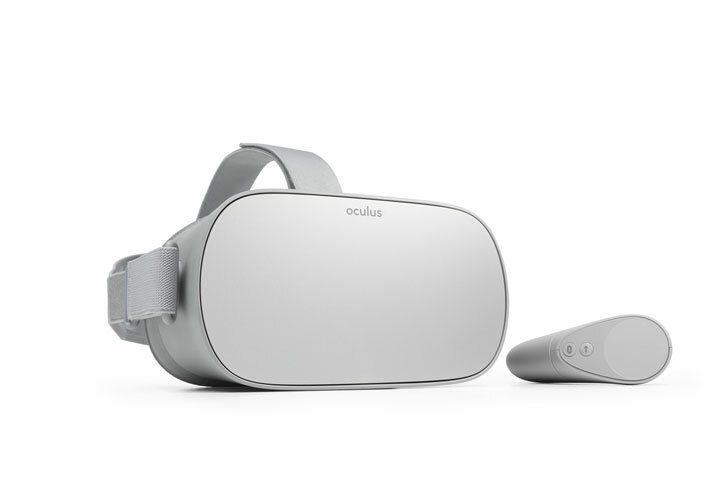 Released in May 2018, this standalone headset has everything you need for a high-quality VR experience at an affordable price. It also supports a 3 degrees of freedom ("DOF") controller, making it easy to point and navigate through your properties. We pack the virtual tours created from renderings and 360-degree panoramas into an easy-to-use, branded app for you. Put all your mobile devices to use and have your agents carry every property in their pocket - for ad-hoc demos anytime, anywhere. And let your future residents discover their future home from the comfort of their home. An intuitive interface lets you browse all your properties and queue them up for a customer to view. Available since June 2014, the Cardboard works on all major iOS / Android devices. Controls are handled through a gaze-based point-and-click user interface. This is a great giveaway at events to engage and impress your future tenants. Available since November 2015, the Gear VR works on all major Samsung Galaxy phones. It is easy to carry and provides a high quality VR experience. It also supports a 3 degrees of freedom ("DOF") controller, making it easy to point and navigate through your properties. Available since November 2016, the Daydream works on select Android phones: Google Pixel series, Samsung Galaxy S8, Huawei Mate 9 Pro, and Motorola Moto Z. It is easy to carry and provides a high quality VR experience. It also supports a 3 degrees of freedom ("DOF") controller, making it easy to point and navigate through your properties. We make sure your teams are effective with the tools we provide. Contact us anytime with any questions or inquiries. Tell us your needs and we can recommend the perfect headset for your purpose. We can find and ship them to you with full instructions, and train your staff on their proper usage. Virtual reality is a fantastic tool, and we want to make sure all your questions are answered. Contact us for private one-on-one sessions. We will show you how to use the devices, incorporate them into marketing campaigns, and triage any problems you have. Market properties before construction. Showcase arch viz tours on the web or in virtual reality. Preserve existing properties via staged captures. Showcase captured tours on the web or in virtual reality. Track the number and location of users viewing your properties on the web or in virtual reality.